"Mr. District Attorney! Champion of the people! Defender of truth! Guardian of our fundamental rights to life, liberty, and the pursuit of happiness!" Mr. District Attorney was one of radio's most prolific public officials, cracking down on cons and solving a vast array of murders. Dwight Weist, Jay Jostyn, and David Brian take on the title role, facing down racketeers, robbers, safe crackers and kidnappers. Len Doyle co-stars as Detective Harrington, an ex-cop turned investigator for the DA, with Vicki Vola as private secretary Edith Miller in this 8 CD set. 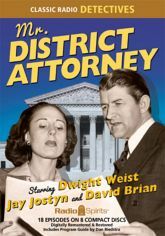 Enjoy 18 digitally restored and remastered episodes, including the 1939 promotional show featuring District Attorneys from around the country. Includes a Program Guide by Daniel Riedstra.